The Nigerian Army has reacted to reports of crisis within military following the recent mass retirement of 200 senior officers. 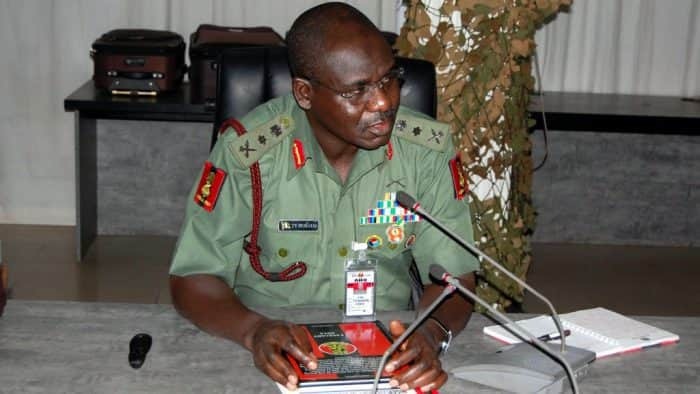 A statement by the director, Army public relation, Aliyu Yusuf, said the publication trending in the social media and some sections of the main stream media about the retirement of some officers from the service of the Nigerian Army. Yusuf said while it is true that the Nigerian Army recently advised some categories of Officers to apply for voluntary retirement from service, the number being flaunted is far from the truth. He also said that the assertion that those affected were mostly Officers who attended the Nigerian Military School, Zaria is equally not correct. The Army spokesperson said while the issue is strictly a service matter, it is essential to address this deliberate misinformation being peddled to erroreneous information. "It is important to note that pursuant to Rule 020810 Paragraph 1 of the Public Service Rules (PSR) of the Federal Republic of Nigeria 2008, the compulsory retirement age for all Grades in the service shall be 60 years or 35 years of pensionable service whichever is earlier," Yusuf said. "Also, rule 020810 paragraph 2 of the same PSR provides that no officer shall be allowed to remain in service after attaining the retirement age of 60 years or 35 years of pensionable service whichever is earlier. In the same vein, chapter 1 section 4 paragraph (P) of the Harmonised Terms and Conditions of Service Officers 2017 (Revised) states that military service of an officer is a period of unbroken service in the Armed Forces of Nigeria from the date of commission to the date of retirement from service. "This period of unbroken service covers date of enlistment into service as soldiers/ratings/airmen for Regular Commission, Short Service Commission, Direct Short Service Commission, Direct Regular Commission, Executive Commission Officers including other Commissions. It is in the light of these aforementioned provisions that the affected Officers were advised to apply for voluntary retirement to avoid being considered for compulsory retirement by the Army Council. Suffice to also state that contrary to the misinformation being peddled, the Officers so advised cut across all category of commissions in the Nigerian Army and must have met either of these criteria as espoused in the aforementioned provisions of the law. It is therefore wrong, not true and deliberately misleading to allege that most of the officers so advised were those of the ex- boys of the Nigerian Military School Zaria. Retirement do not necessarily follows Commission. Several Officers have silently proceeded on retirement on attainment of the provisions of the law. Every officer and soldier knows when his date of retirement or run out date is due and as such prepares for it," Yusuf noted. The Army further called on the Nigerian media to verify information from the appropriate source before rushing to press to avoid fake news that is not credible and also misleading the public. Meanwhile, Legit.ng previously reported that Brigadier General Sani Kukasheka Usman, the director of Army Public Relations, will finally be retiring after over 30 years in active service serving Nigeria. Usman is rated as one of the very best spokespersons the Army has had in recent times. Usman announced this in a statement informing Nigerians that he would proceed on a terminal leave on February 8, 2019 leading to the end of his service to the country.